This set of brief pieces examines the relation of power to knowledge. Lippmann paid little homage to the innate wisdom of the people. While he had no wish to disenfranchise citizens, he believed elites drove the engines of power. His point was that liberty and democracy require government that will, when necessary, "swim against the tides of private feelings." Because the public is too divided, poorly informed, and too self-regarding, authority has to be delegated, perhaps to "intelligence bureaus," or at least to those who are wiser than the many that have the power to decide vexing questions on their own merits.Lippmann knew that in the real world we cannot expect to be ruled by philosopher-kings. While ready to settle for less, he was not ready to settle for politicians who get ahead "only as they placate, appease, bribe, seduce, bamboozle and otherwise manage to manipulate demanding and threatening elements in their constituencies." 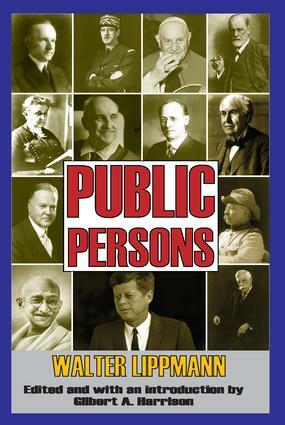 The seducers and bamboozlers were generally in charge, and because they were in an age "rich with varied and generous passions" they had become disorderly and deranged.Public Persons is the informal side of The Public Philosophy. Lippmann tries to account for the decline of Western democracies and prescribe for their revival. He concludes that it is not possible to discover by rational inquiry the conditions that must be met if there is to be a good society. Lippmann saw tension between private impulses and transcendent truth as the "inexhaustible theme of human discourse." The occasional harmonies in the lives of saints and the deeds of heroes and the excellence of genius are glorious. But glory was the exception, wretchedness the rule. In this casual volume both are given a human face.